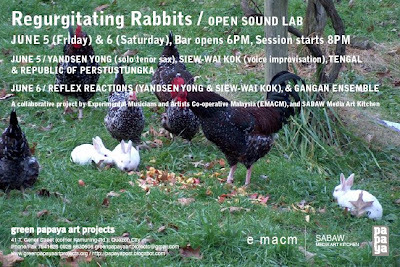 Green Papaya Art Projects and SABAW Media Art Kitchen welcome Malaysian experimental sound artists Yandsen Yong and Siew-wai Kok in Regurgitating Rabbits, a two-day session of improvised encounters and open sound lab. A collaborative project by Experimental Musicians and Artists Co-operative Malaysia (EMACM) and SABAW Media Art Kitchen, the open sound lab is a platform that encourages cross-border and cross-disciplinary collaborations among contemporary sound, performance and electronic media artists practicing in Asia, Europe and the U.S.
Yandsen Yong is a woodwind musician, he plays the saxophones, clarinet and flute. Yandsen was the veteran lead vocal and band leader of the explosive Malaysian Chinese rock band Moxuan in late 1990s. He then ventured into a new direction in music – free jazz, improvised music and contemporary composition. Yandsen is the woodwind player of Klangmutationen (Malaysia), where the band has released albums through Utech Records (USA) and Dream Sheep (Italy). He has collaborated with artists and musicians such as Kar-Mun Tham, Lee- Kwang Goh, Ronnie Khoo, Aziz Ali, Siew-wai Kok, Chor-Guan Ng, Sow-Yee Au, Donna Miranda, Darren Moore, Brian O’ Reily, Thierry Monnier, punk band Carburetor Dung and many more. Yandsen has played in Notthat Balai Art Festival 2007 (Malaysia), Mosaic Festival Singapore 2008 and Choppa Eclectic Improvised Music Festival 2008 (Singapore). Yandsen is a member of the Experimental Musicians & Artists Cooperative Malaysia (EMACM) and the co-founder of Studio in Cheras, Kuala Lumpur (SiCKL). Siew-wai Kok is a voice improviser and video artist. She has studied and lived in USA for 7 years. During her stay in the States, she has studied with a few art luminaries such as Pauline Oliveros, Tony Conrad and Peer Bode, who have introduced her to a whole “new world” in the arts. Siew-wai has participated in festivals such as the Iskandar Malaysia Contemporary Art Show 2009, Nyoba Kan Butoh Festival 2008, Choppa Eclectic Improvised Music Festival 2008 (Singapore), Notthatbalai Art Festival 2007, International Film Festival Rotterdam 2007, Beyond/In Western New York Biennial 2005 and more. Siew-wai has collaborated with video artists, dancers and musicians, such as Koji Tambata, Sow-Yee Au, Donna Miranda, Lena Ang, Swee-Keong Lee, Chor-Guan Ng, Steve Baczkowski, Patrick Cain, Jax Deluca, Scott Valkwitch and more. She collaborates regularly with members of the Experimental Musicians & Artists Cooperative Malaysia (EMACM) since 2006. Siew-wai is the co-founder of Studio in Cheras, Kuala Lumpur (SiCKL). Reflex Reactions is an improv duo made up by Yandsen Yong and Siew-wai Kok where Yandsen plays the saxophone, clarinet and flute while Siew Wai does voice improvisation. The duo creates musical conversations through attentive listening and communication with each other. “Create ‘NOW’” is the motto of this duo. Republic of Perstustungka is an informally organized band composed of Yandsen, Siew-wai and Donna Miranda. The group performed during Notthat Balai Art Festival 2007 (Malaysia), and had gigs at SiCKL in Cheras, Kuala Lumpur also in 2007. The Gangan Ensemble is loosely composed of improvisers who work on both sound and video formats that was created to explore the intricate and different kinds of interaction and ways of harnessing sound/energy/musicianship alongside moving images. The ever-evolving membership involves a variety of video-performance artists (VJs) and electro-acoustic musicians from the Philippines, Singapore, USA, Germany, Australia, UK, Slovenia, Malaysia, and Indonesia since it's incarnation in 2007. The ensemble has performed in various countries in South East Asia, notably in NCCA's Sinemusikalye in Manila, in Choppa 2008 in Singapore, in the Cellsbutton Media Art Festival in Indonesia, and recently with electro-acoustic composer Chris Brown in Manila. 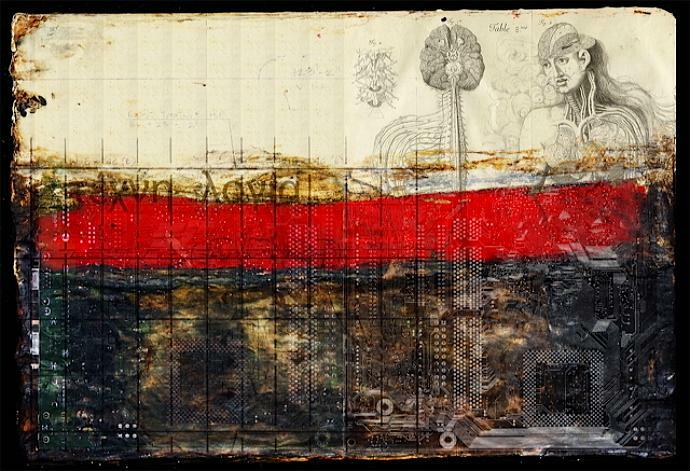 It was founded by media artist Tengal with Tad Ermitano. Dec TBA: Fete dela WSK!